These are my favorite Foam Squares. There are 440 adhesive squares which include 1/4 " squares & 1/2 inch squares. The squares are 1/8 inch thick and perfect for creating 3-Dimensional projects. One thing I love about them is the paper peels off easy. I have had some that I had a horrible time getting the backing off of it. $3.98 plus shipping. 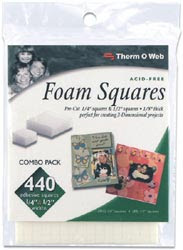 Please e-mail me if you wish to purchase a package of these foam squares. I accept Visa, Master Card, Discover and PayPal.